From ominous beginnings as the weekend house band at a Dakar club for government officials, Senegal’s Orchestra Baobab, named for the club (which in turn took its name from the native baobab tree), went on to become one of the prominent bands of world music, with an influence that extended far beyond their national boundaries, throughout West Africa and into Europe. Put together by original leader and saxophonist Baro N’Diaye, the first version was a seven-piece group, three of them enticed away from Dakar’s biggest band, the Star Band, who had a regular gig at Ibra Kasse’s club. While they had a strong Cuban influence — Cuban music had been a prevalent sound throughout West Africa since the ’40s, imported by sailors and played on the radio — Orchestra Baobab added African music, in large part from griot singer Laye M’Boup, who had a vast repertoire of Wolof material. In the glamorous world of Senegal’s 1970s nightclub scene, there was only one band worth dressing up for. Orchestra Baobab formed in 1970 as the house band for Dakar’s Baobab club, where artists, politicians, intellectuals, movie stars and the occasional visiting dictator met to dance to the band’s mix of Cuban and Casamance (south Senegalese) rhythms. Hired to play the music that audiences wanted to hear from traditional songs to the latest chart hits, Orchestra Baobab rapidly outgrew their status as a house band and became famous all over Africa. It wasn’t long before the new sound proved so popular that the group wasn’t just entertaining on weekends, but every night of the week, being hailed on par with Guinea’s legendary Bembeya Jazz National for their fusion of sounds. Inevitably, personnel fluctuated and the new musicians brought their own influences, expanding the feel and range of the band with Maninke and Malinke songs, which became integrated into the whole. Perhaps the most important addition was singer Thione Seck, who took over the lead vocalist spot after the death of M’Boup in a 1974 car wreck. While Senegal’s élite danced till dawn with their soignée girlfriends, Orchestra Baobab began leavening the strictly Cuban diet with a rich array of African elements. Atisso brought his idiosyncratic version of the Congolese guitar style, Gomis the lilting ballads of the Casamance, Senegal’s forested southern region. Nigerian saxophonist Peter Udo introduced a touch of honking high life, while Ndiouga Dieng, a griot, a traditional praise singer, represented the neo-Islamic sounds of Dakar’s hinterland. They continued to play the Baobab Club regularly, but also entertained at state occasions, such as official New Year’s Eve dances and even at the wedding of designer Pierre Cardin’s daughter in Paris. Finally, the Baobab Club closed in 1979 and the band went on to make their home at the Ngalam nightclub (or the Djandeer Club, according to some historians). Also during this time, they tried to make their mark in Europe by traveling to Paris in 1978. They recorded On Vera Ca: The 1978 Paris Sessions, one of their best discs and certainly the best-produced, although it leaned too heavily on their Spanish-language material. Other than that, the trip proved to be a disaster, losing money, and they returned home. At the beginning of the ’80s, they were indisputably Senegal’s biggest band. They recorded regularly (two albums, Mouhamadou Bamba and Sibou Odia were edited into Bamba, a 1983 U.S. release), and continued to stretch their limits by bringing in more African influence, which reached its height with the classic Pirates Choice of 1982. But while Baobab remained Senegal’s top group up to the late Seventies, the balance of society was changing. The band barely noticed it, but out in the quartiers populaires , the sprawling, largely impoverished suburbs, where nobody cared about suits, ties or the cha-cha-cha, a pop revolution was underway, centred round a young singer, Youssou N’Dour, and a raw new music called Mbalax. The African percussion that had been subsumed into Baobab’s gentle sound was brought right to the surface, alongside griot vocals, sax and rhythmic guitar; the linguistic medium was exclusively Wolof, the lingua franca of modern Senegal. Suddenly finding themselves without gigs, and unwilling to adapt to the new trends, Baobab split and might have ended up a mere footnote in musical history were it not for the belief of a small number of Western enthusiasts, notably Nick Gold of World Circuit Records. While new African music was becoming increasingly formulaic – N’Dour’s huge-selling ‘7 Seconds’ with Neneh Cherry being a prime example – Baobab’s music harked back to the earthy, organic feel that had attracted Western ears in the first place. They tried to compete by updating their sound, but it didn’t work and by 1987, Orchestra Baobab had disbanded. However, everything comes full circle and in 2001, with the European reissue of an expanded Pirates Choice (2002 U.S.), Orchestra Baobab, older and wiser, re-formed and played dates around the globe, going into the studio to make a new album — produced by the man responsible for their fall from grace, Youssou N’Dour. Ousmane Sembene was for many, including myself, Africa’s greatest ever film director. 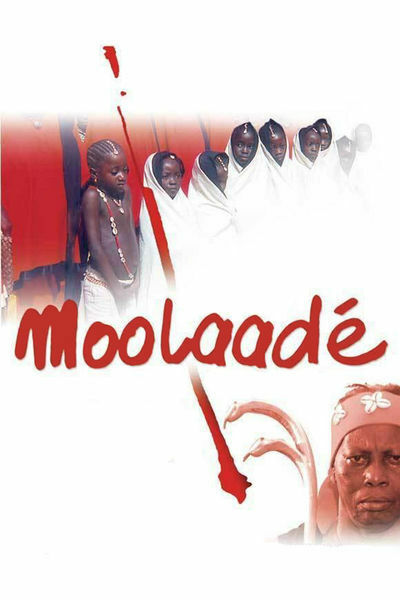 His last work, Moolaadé (the title means physical and spiritual protection) is a fine and brave work, set in an Islamic village in Burkina Faso. On the surface, this is a cheerful, traditional community, clean, colourfully dressed, not prosperous, but getting by. A beautiful 17-year-old girl is awaiting the return from Paris of the headman’s son to whom she is promised in marriage. But her mother, Collé, the independently minded second wife of a weak, wilful husband, has refused to have her subjected to female circumcision. Then five 12-year-old girls come to Collé in flight from the regular ‘purification’ (i.e. mutilation) ceremonies and she gives them her ‘moulaadé’. This unleashes powerful conflicts in the village. The elders turn on Collé, as do the team of red-robed women called the Salidana, who carry out the often fatal circumcisions. Her daughter can no longer marry her fiancé, who, despite his new Western ways, bows before his father’s demands. Detecting the source of subversive knowledge, the males seize the women’s battery-operated radios and make a bonfire of them. An itinerant trader, a rebellious outsider, who has a background of insubordination in the army, takes Collé’s side when her husband whips her in public. That night, he’s driven out of town and murdered. This powerful movie addresses female mutilation as both a cruel practice to be abolished and as a metaphor for the traditional subjugation of women in a society dominated by self-regarding men who stand idly by as their wives do most of the work, the thinking and the child rearing. It ends affirmatively with the women on the point of controlling their destinies. The film has as its centrepiece a stomach-turning scene of a screaming girl being ritually cut, juxtaposed with an image of Collé’s husband enforcing his conjugal rights. Collé’s stand leads to a kind of martyrdom for her; the village elders order a totalitarian bonfire of radios, which are filling up the women’s heads with modern ideas – but it ends on a note of hope and change. This is a movie about contemporary sexual politics in which there is something very real at stake. The final contrasted images are of an ancient ostrich egg that has stood atop the mosque for two centuries, and a TV aerial, a hopeful link to a future of information, education and a world elsewhere.